Enter Saul Reardon, an enigmatic man whose sole purpose in life appears to be helping those in trouble. Saul is a mystery, his real motivations and resources never fully explained (maybe we’ll get more in book 2?). I equate him to a Robin Hood-like character, replete with his own “Little John” aka his best friend: the womanizing muscle-head Ethan. I enjoyed this mystery. Alternating POVs between Claudia and Saul kept the tension high. As Claudia digs into her unknown past we get to witness a wonderful character transformation. Doubts give way to answers and she finds her own kind of strength to carry her through. But there are still so many unanswered questions! Is Claudia finally safe? What really happened to Saul’s family? Is Claudia really the key to finding out, as Saul suspects? Who are the mercenary-like soldiers Saul calls for reinforcements when the chips are down? Who is the real villain, still hiding in the shadows at the end of this installment? *shakes fists at the heavens* Damn you Neven Carr! This was a very well written book. The characters, and their responses, were very realistic. The only fault I would give is the number of unresolved issues. I understand this book is part of a planned series, and my assessment might change after I read book two, but right at this moment the number of loose ends is driving me crazy. Guess that’s a good sign; it means I care about the story and its characters. 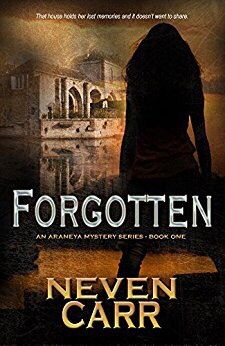 Interested it reading Forgotten for yourself? Pick up a copy HERE (free on Kindle Unlimited). Thank you Jessica, for taking the time to read and review my novel! Reblogged this on The Araneya Times.